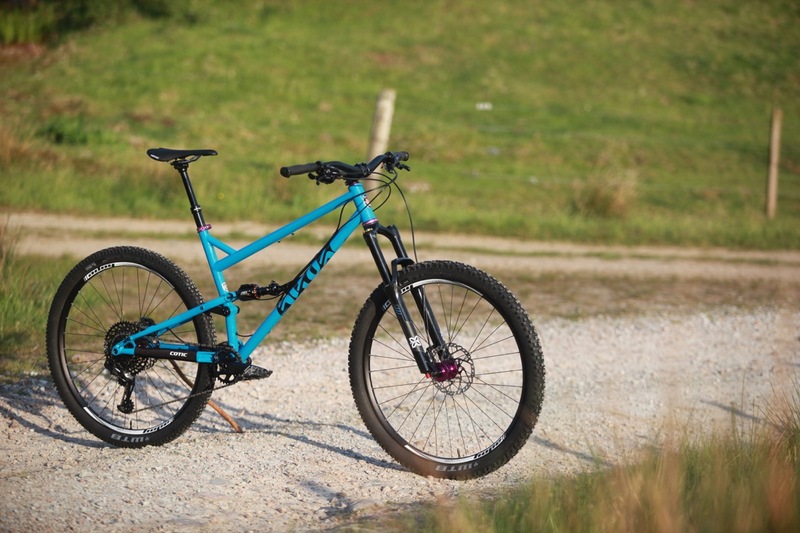 Cotic, the Peak-district based purveyors of made out of metal bicycles, first introduced the 29in/27.5+ wheeled FlareMAX model in 2016. This biker here is the second iteration of Cotic’s 120mm travel, do-it-all, up-for-most-things, full suspension trail bike. While at first glance it looks familiar to the first version there have been numerous subtle changes to fixtures, fastenings, the spacing of things, construction detail and most notably the unleashing of Longshot geometry. What’s that then? It is, of course, the movement of the geometry slider towards slacker and longer. Don’t sigh too much, there’s a bit more to it than that. Cotic’s second generation FlareMAX. Just built freshness basking in golden hour sunshine before the first ride. Cotic has been experimenting with progressive geometry for a while now. We first saw it with a collaboratively built prototype bike dubbed the ‘Longshot’ back in 2016 at the Bristol Bespoked bike show. 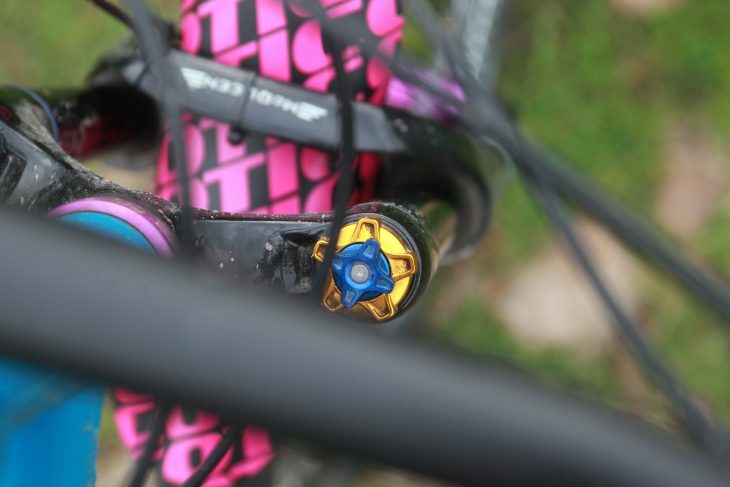 This new geometry thinking is now a key part of how Cotic do things. Cy and his merry team are designing all of their new generation mountain bikes the Longshot way. Whereas some brands are tip-toeing forward, Cotic has really gone for it with reach increasing by some margin. Reach figures for the new FlareMAX are up significantly across the size range, including the newly introduced Small size option up to the X-Large I’ve been riding. All sizes are optimized for a 35mm stem length. With 130mm fork travel the head angles now sits at 65.6°, which is over a degree slacker compared to the previous FlareMAX, though the BB drop and chainstay length are pretty much the same. Because of the increase in reach, the overall wheelbase is much longer than before. Seat tube heights are not as high than previously and the Ovalform top tube sits lower. 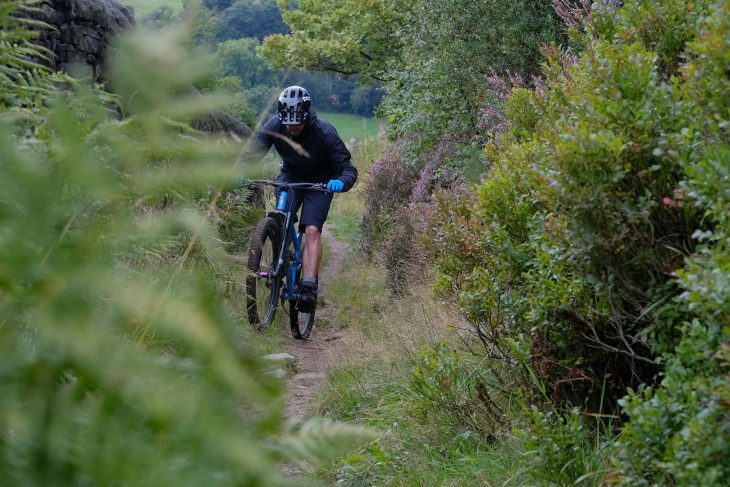 As such, standover is greater and this allows for some flexibility with sizing choice and accommodates longer range dropper seatposts, meaning you have the option to size up if you wish. All measurements are static based on 130mm travel fork. So that’s how things are laid out. What’s the second generation FlareMAX made of? There’s some changes but the FlareMAX is still made from steel. This time the Reynolds 853 sticker is reflective! Well, what it’s made of hasn’t changed. It’s still made mostly from good ol’ steel tubes and uses Cotic’s time served droplink suspension platform. The FlareMAX has the same simple and clean aesthetic as before, looking positively slender and lithe when parked next to a carbon trail bike. 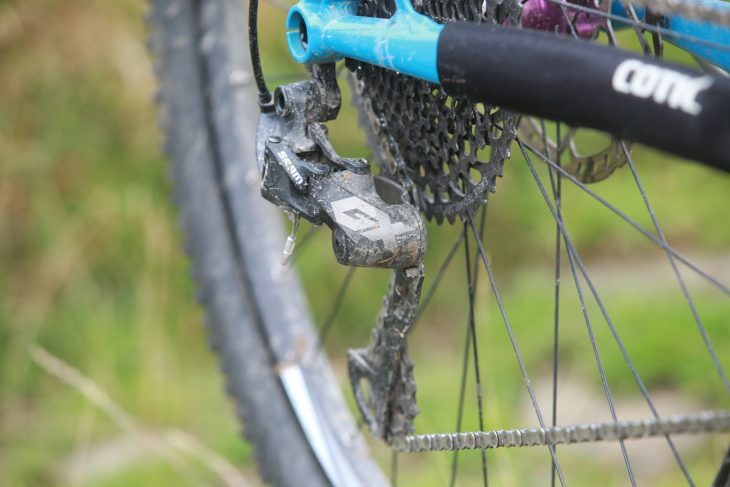 It’s now 1x drivetrain only and there’s been a raft of other changes to fixtures and fastenings, cable routing, shock length and stroke, rate of progression, water bottle placement and both main pivot bearing size and tyre clearance have grown. 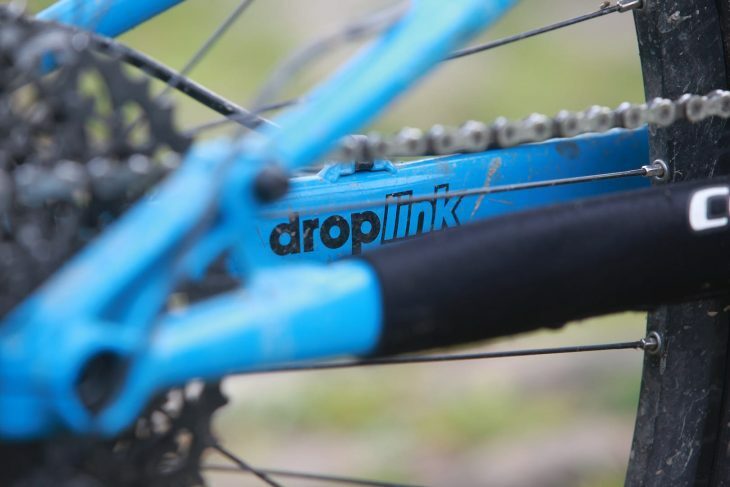 Cotic’s droplink. Linkage driven single pivot suspension. Running a higher leverage ratio and more progression than before. Neat integrated threads for pivot hardware and external/internal routing for gear cable. 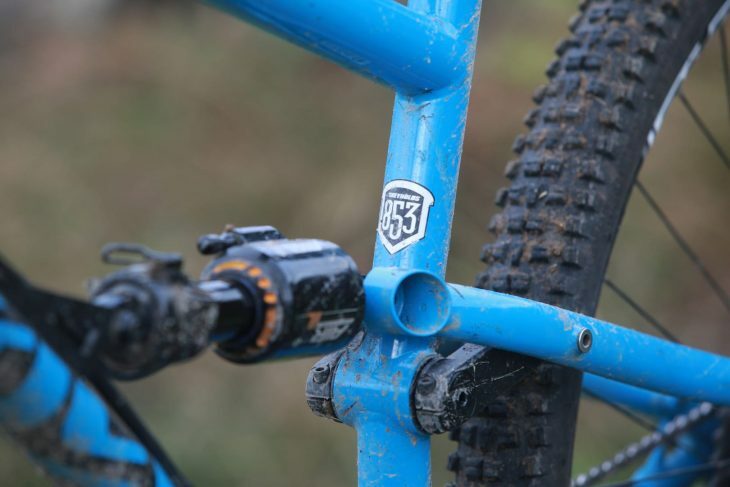 There’s still the option to fit either 29er or 27.5+ wheel sizes. With different spacing of the droplinks and a newly configured forged chainstay yoke, there’s now room for 27.5 x 3in tyres with plenty of room for muck. At the dropout end there are some neatly integrated threads for the pivot points and overall the chainstay is a touch deeper. 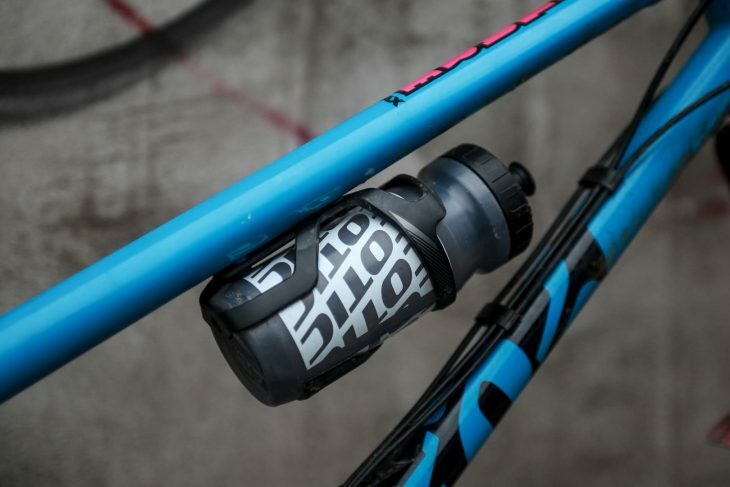 Water Bottle location is mid-mount on the underside of the downtube. Makes for easier access. Minimalists and backpack naysayers rejoice! As before there are water bottle bosses on the underside of the top tube. The positioning has been shifted forward which not only improves ergonomics but also frees up room for a piggyback shock should you wish. Integrated mounting points for a OneUp chain guide and x2 ISCG 05 mounts for a bashguard. Neato! 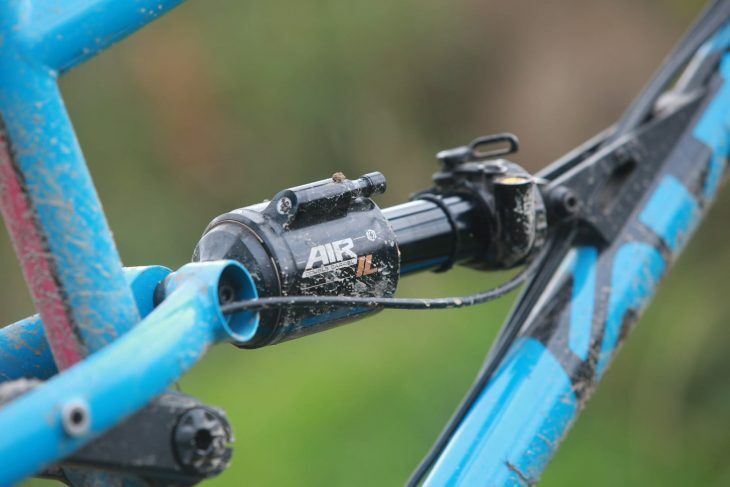 The frame has no provision for front derailleurs, although there is Cotic’s own mounting point for a chainguide and two mounts underneath the threaded BB shell for fitment of a bash guard. Oh! 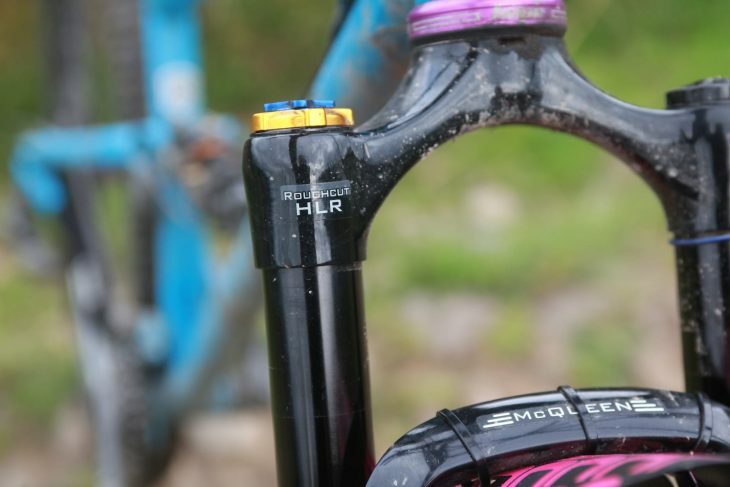 One more thing – with the use of a stouter downtube useable fork range increases to 140mm compatibility. 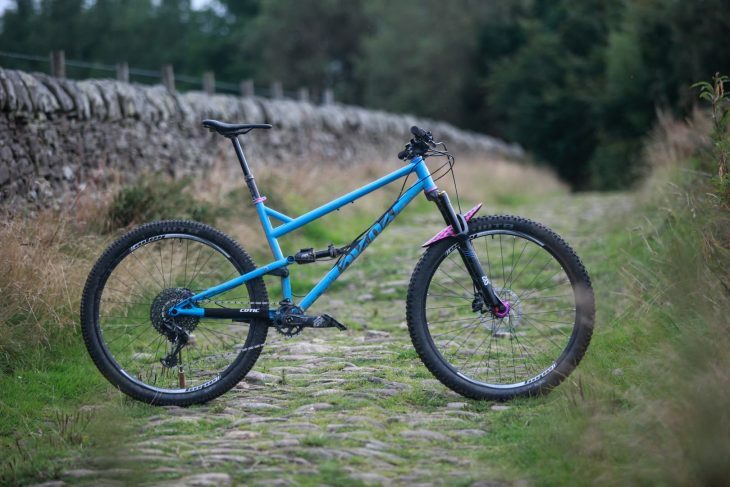 So while it’s not easy to spot at first glance, there has been a number of changes to the way the new Cotic FlareMAX has been put together as well as a couple of new features here and there. Taking care of the lumps and bumps out back there’s Cane Creek’s Double Barrel Inline air shock. 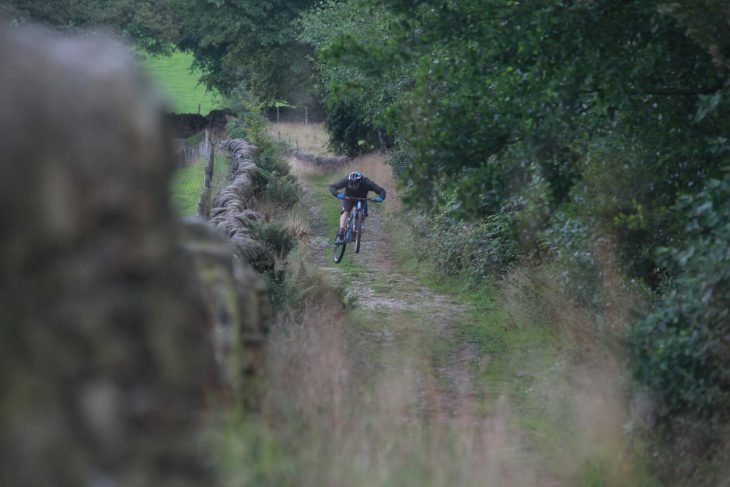 Cotic recommends a sag range of 25% – 30% depending on what ride feel you wish for. You can go 25% for a firmer ride, or 30% for a more supple ride. The shock is tuned for the bike and comes shipped with recommended base settings for both high and low speed compression and rebound. After some experimentation, I settled on 30% sag and a touch more high-speed and low-speed compression over the base tune. The Double Barrel is a super tuneable shock with adjustments for, well, everything. There’s a climb switch should you need it for those long unrelenting uphill drags. I did flick this switch to see what happened but left it alone for off-road climbs only employing it for long and smooth ups. Cotic’s droplink suspension works very well. After initial ease of movement that maximises traction, the linkage driven single pivot suspension is supportive in the mid-stroke and ramps up significantly towards the end resisting bottom out well. It’s very progressive and with high levels of anti-squat giving both good control and an efficient feel. The ride feel of the FlareMAX is more rally car than trophy truck. 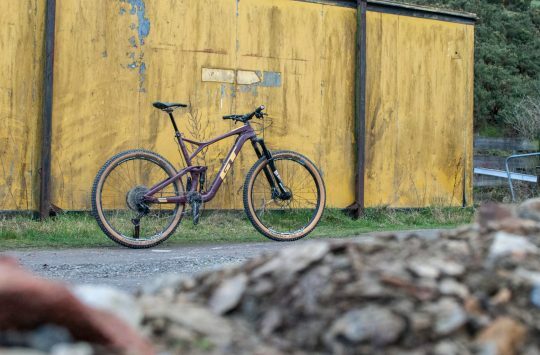 My version of the Gold Eagle 29 specification differs from standard with the fitment with an X-Fusion McQueen fork, whereas the stock builds comes with a Cane Creek Helm at 130mm travel. Cotic’s bike builder gives you a few component options and this is one of them, and I was happy to run the X-Fusion fork as it meant I could explore different travel settings. The FlareMAX can run from 120mm – 140mm. I tried both 140mm and 130mm settings. Gold and Blue dials. Fiddle with them to get suspension just so! The X-Fusion McQueen fork comes in at a cheaper price point than comparable options from competitors and with the Roughcut damper, performance is superb. There are adjustments for rebound and both high speed and low speed compression. No complaints here. The FlareMAX is available a number of different ways from frame only at £1499 to full bikes starting at £2749 for ‘Silver’ level build and up to £4799 for the ‘Platinum’ range topper. As mentioned there is the option to change components or match/not match colours as your heart desires/bank balance allows. This build is based on the Gold EAGLE 29 specification with a different fork, Hope Enduro wheels in place of Hope XC wheels and purple Hope bits wherever possible. The FlareMAX offers 27.5+ compatibility. I tried it but didn’t really take to it. There’s ample clearance for 3in wide tyres. This may be a personal feeling but I found that, set up with 27.5 x 2.8in tyres, the ride height of the bike was too low for anything but smooth and wide trails. There’s also a vague feeling when loading the bike through corners, which was at odds with what is otherwise a focused-feeling bike. I very much preferred the more precise feel from the standard 29er wheels. To get a more useable ride height I found that with the 27.5+ wheels fitted I had to up the pressure in the shocks and run 25% sag as opposed to 30% when using 29er wheels. If 27.5+ compatibility is to be offered I would prefer to see a flip-chip/some form of adjustment that compensates for the difference in overall diameter. Because although the wheel size difference between 29 and 27Plus is close, it’s not close enough to switch without making some changes to the bike (Ed – you get more sag out of a plus tyre too, which lowers the ride height). This in turn affects the ride characteristics. 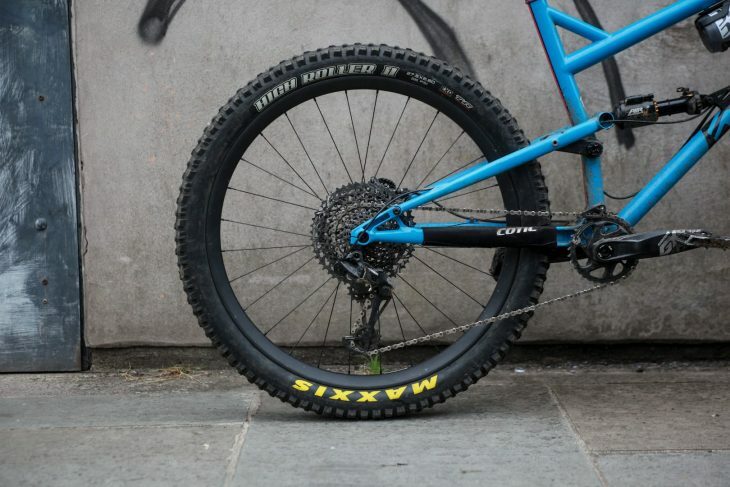 Hope’s narrow rims are laced to superb PRO4 hubs and whilst the wheels are strong and feel precise, with a 23mm internal width support for tyres is left wanting somewhat. 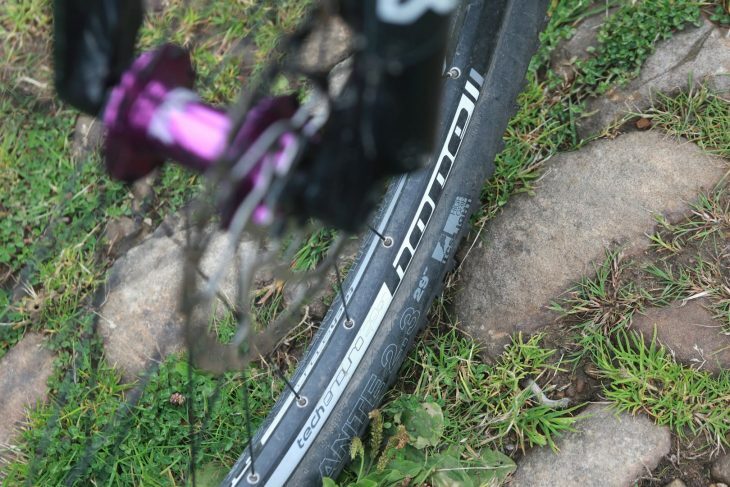 The wheels are set up tubeless from the get-go which is great but the rims are on the narrow side – not so great. As a result, the Hope Enduro rims took a beating, especially the rear. During the test period there were many rim strikes and time spent re-tensioning loose spokes. Whilst the Hope hubs are superb the enduro rims are on the slender side & the rear especially took a beating. Tyres are from WTB, a mullet combination of business up front in the form of a Vigilante 2.3 and Trail Boss 2.25 for party out back. They’re set up tubeless from the get go which is great and the tyres are good but a lack of stability due to the too-narrow rims does make for a vague feeling as the rubber is prone to squirm and twist unless ran at higher pressures. Shimano XT brakes with 180mm rotors front and rear worked well in slowing things down. I would be tempted to switch the front rotor to a 203mm though for improved speed control. GX Eagle. 12 wide-ranging speeds. 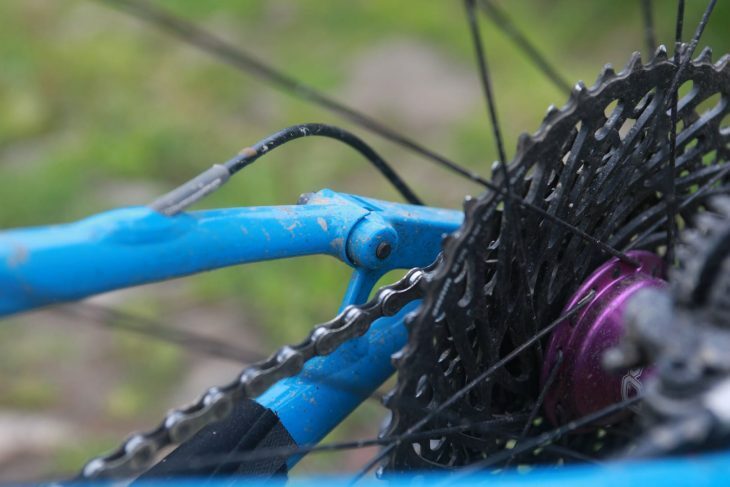 SRAM 1×12 GX Eagle is used for the drivetrain. 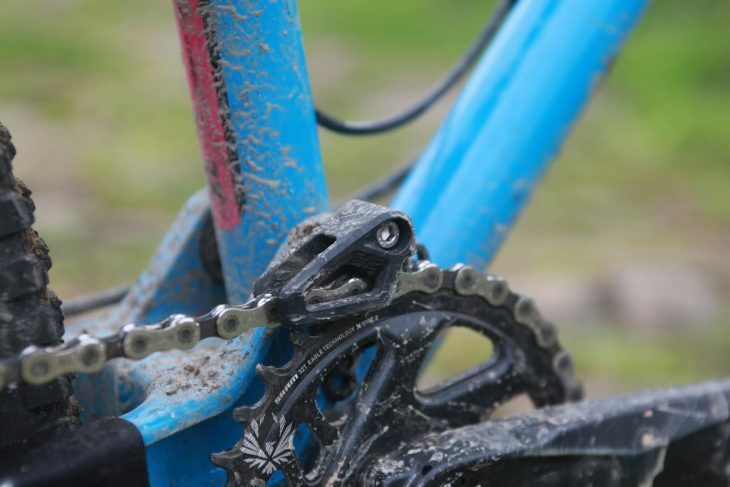 A 10-50T cassette paired with a 32T front chainring gives a usefully wide range of 12 gears that proved reliable, working without issue with a characteristic solid feel and clunk to shifts for the duration of the test period. Other bits and pieces? The X-Fusion Manic dropper post worked a treat, with a healthy 150mm drop to get the saddle out of the way and a well placed, nice feeling lever. I wasn’t a fan of the own brand saddle and can’t comment on Cotic’s handlebars or grips as I asked for none. I spent a good amount of time riding the previous version of the FlareMAX and got on with it well. On the first generation bike (X-Large size) with 130mm forks the reach was 467.3mm. It’s now 507mm long – an increase of 40mm. The head angle has slackened by over a degree to 65.6º (from 66.9º). Those two changes together mean the wheelbase has grown a whopping 50mm. Interestingly, and somewhat against the wave of change, the seat post angle is slacker than before at 73.6°. The first ride was and wasn’t quite what I was expecting. 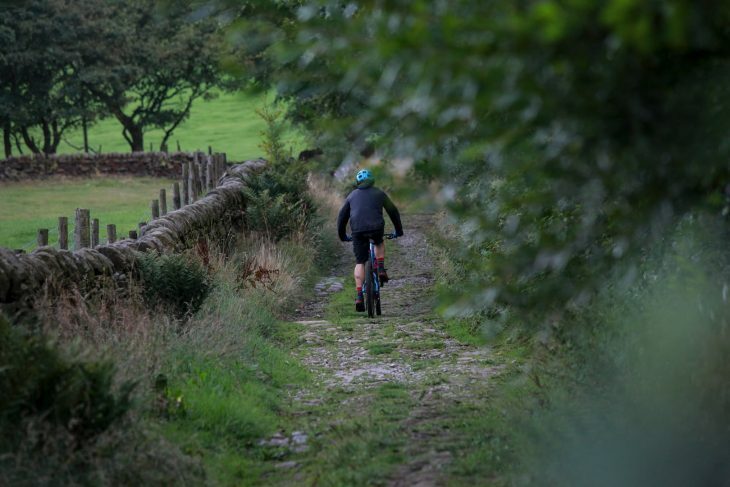 I was ready for the bike to feel longer, but sitting on the saddle and pedalling to the trail the bars felt really far away and oh my goodness I wasn’t getting on with that Cotic saddle. I am sure that somebody’s bum loves it but not mine. Climbing up the first steep incline I found that I was fidgeting somewhat and shuffling forward on the saddle to keep the front end down. Dropping the saddle to head down and stood up the position felt much better, great in fact. So what was going on? Why the disparity between seated and standing? After unboxing the bike I had set the seat height to where I needed it and dropped the nose of the saddle a touch but the saddle was set up right in the middle of the rails. I slid the saddle as far forward as it would go and hopped back on. Much better. Up. Once I’d pushed the saddle forward to achieve a steeper effective seat angle the climbing position was for me much improved. It should be noted that I have particularly long inside leg and arm span measurements for my height. Still, with the fork at 140mm that seat tube angle is not especially steep at 73.1º. Once I had achieved a more forward seated pedalling position I found myself in a better place and the issues experienced on that first ride were gone. With the effective seat angle now steepened a degree or so, my seated riding position had changed from being too far back to centred. Climbing on the FlareMAX is a steady away affair. Sit and spin is the preferred method. With a calm and collected approach, progress is efficient. But I still can’t help thinking that a steeper seat angle from the get go would improve things here. Heading down it’s a different story. The FlareMAX is superfast. With the front wheel out in front, that generous wheelbase and a centered dynamic ride position this bike flies! 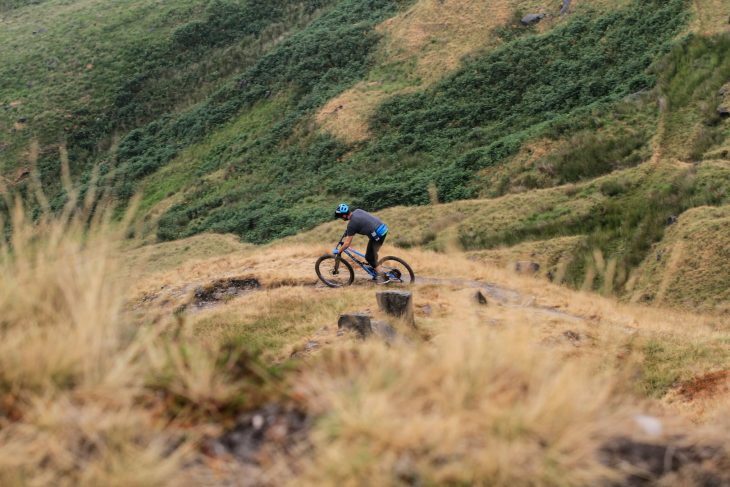 It’s willing and able to speed along and be sent down steep and challenging trails as much as it is happy to head out for a big ride in the hills. The droplink suspension is configured to be progressive, ramping up significantly at the end of the stroke. With a short stroke and 30mm less than ‘enduro’ label travel it’s no magic carpet ride, but it is well controlled and wonderfully communicative. This is a bike that you can forge on ahead, be that spinning the cranks and getting up to speed or picking the next thing to launch off. Just riding along it could be said that it feels a little sluggish and slow to react. Because of the sheer length and overall weight (15+ kg! ), there’s a little more effort required to loft and place but really it is just that – a matter of effort. And timing. The suspension can be worked with to pump undulations for free speed and have fun launching out of compressions. So it’s not like there’s no ‘pop’ in this regard. 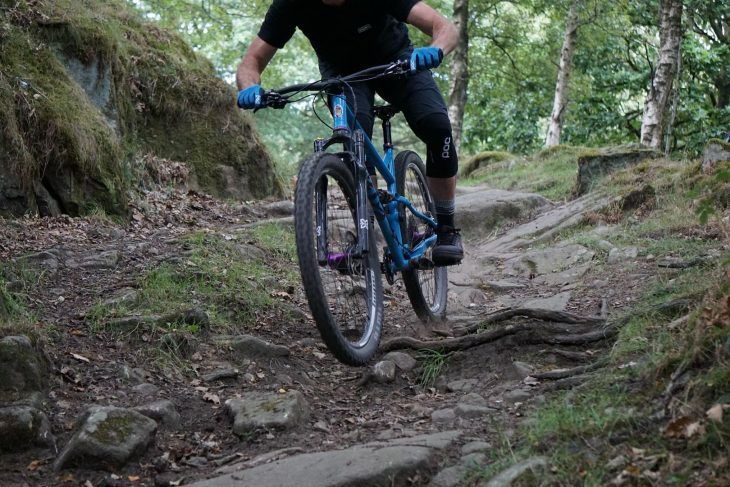 And with plenty of anti-squat there’s a direct pedal feel and it can be hustled up techy climbs and slow speed tricky trail features without wallow or vagueness. Really the FlareMAX has a need for speed and once you are up to speed it kind of slows things down. 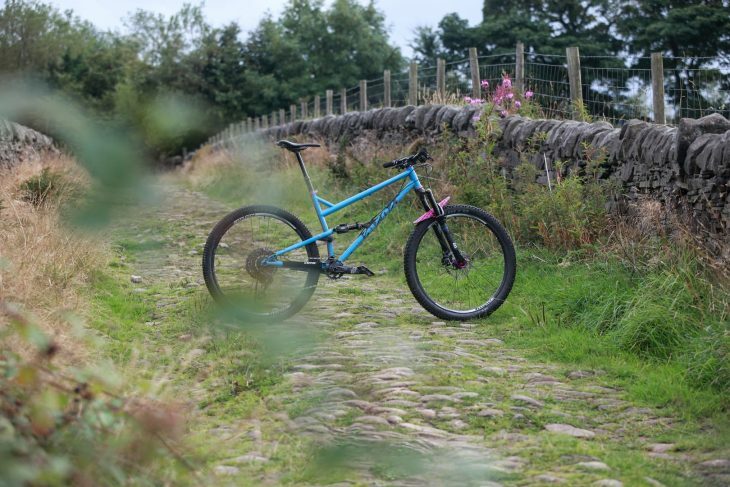 It has a calm, collected and confident ride quality and relishes flowing technical trails. 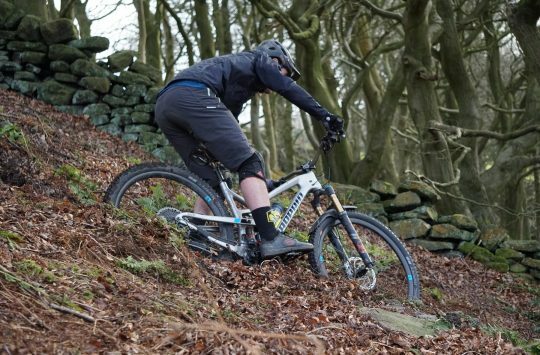 It really impresses with a have a go attitude on steep and awkward terrain. Think you can’t with that much travel? Oh yes, you can. It’s not a chore on mellower flatter trails but does have a pretty chill and relaxed vibe about it. It carries speed well with big momentum carrying wheels and efficient suspension. It’s a really visceral ride and wonderfully communicative that’s both fun and focused as the speed picks up. Superb for messing about in the woods seeking out the challenging lines and difficult trails and with that efficient suspension and roomy cockpit it’s comfortable if you’re heading out further and longer. Cornering’s a hoot! Nice and responsive with that short stem ‘n’ wide handlebar pairing. There’s a really palpable gain in grip that comes from the increase in the length of the wheelbase and a wonderful central ride position. It’s nicely balanced and you know where you are at when loading the wheels into corners. 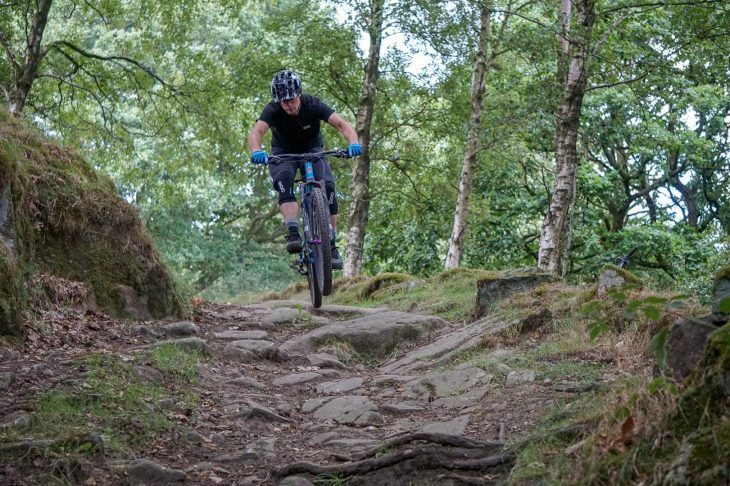 This is a quality that’s both fun and eye-opening to explore pushing the bike through turns and coming round fast with a grin on your face. Whilst I would prefer a steeper seat angle, overall the Longshot geometry is very much a step in the right direction. The FlareMAX remains a fun and versatile trail bike with increased technical terrain ability. Versatility and good vibes. Does a great job balancing fun and confidence. Quite the mix of characteristics and ability. A little bit longer, slacker and lower has been the annual modus operandi with the introduction of new bike models. It’s been the thing to do and most all manufacturers have followed this trend. With its Longshot geometry, Cotic hasn’t followed the fashionistas, it has joined the Avant-garde. 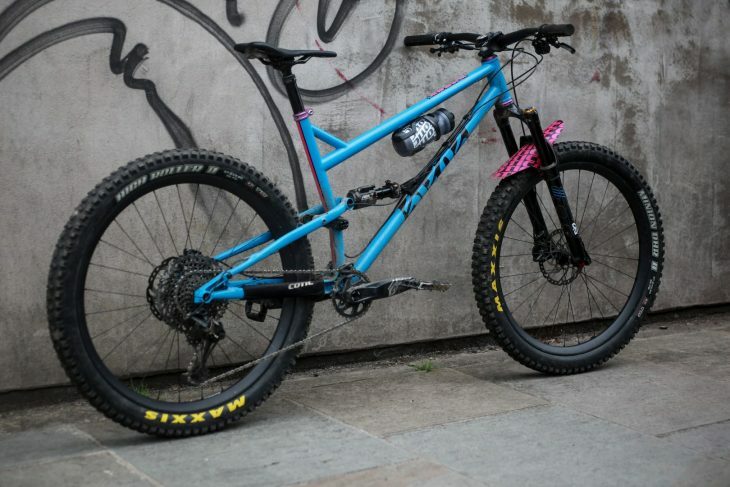 Because of this, it could be divisive, it’s a trail bike that’s got a hell of a swagger. 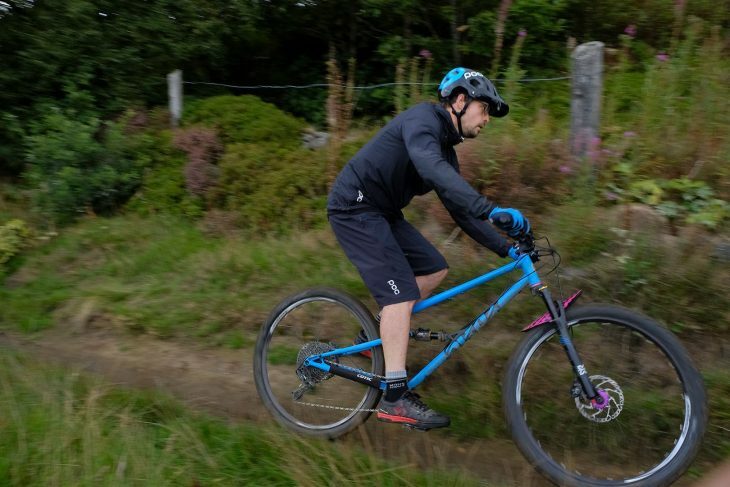 Whilst the FlareMAX is an extremely able all-rounder with superb suspension and geometry that’s up for attack, it does have a penchant for steeper tracks and goads you to go fast, at all times. If you’re not willing, it can feel a little languid but hold fast and it’s eager to get a move on. 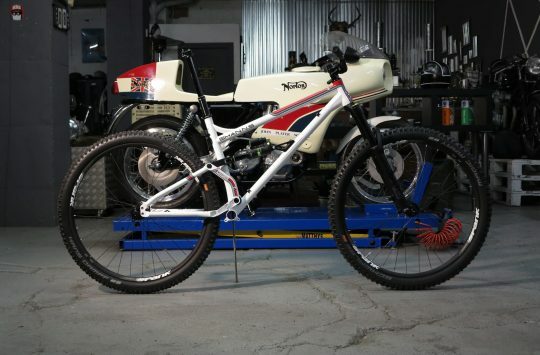 It is perhaps a trail bike for the enthusiast. Afterall it’s an unusual combination of big bike geometry and short travel. Green Eggs & Ham? Either way… It’s a special blend, and very moreish. Nice review, and it reflects the test rides I had on the bike – it was crying out for a more upright seat tube. I guess altering the angle of the seat tube would impact on a few things like seatstays, length/position of the links, leverage ratio? Think I’ll hang on to my current FlareMAX until v.3 comes out. Hi , how tall is the long shot reviewer please? I’m 6ft 6 and as you can imagine , reach is important! Hello there singlewhip. Reviewer stands at 6 ft 1 and a quarter inches tall, 35 inch inside legs & long arms!